~~~Run For One Planet Blog » Where does your garbage go? Last year we talked about where our garbage goes and I talked about a couple of cities that I knew about. 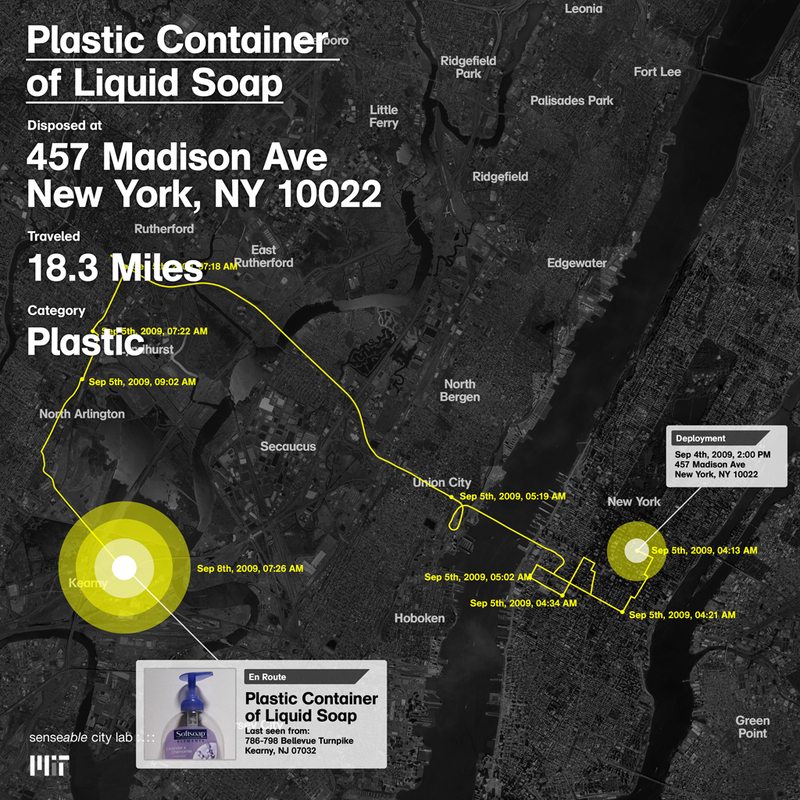 (source) What brought this back up is a study being done by MIT called Trash Track. (source) What they did was attached small electronic trackers to about 500 pieces of waste and tracked where it went. They have plans to extend the study to more cities and thousands of items. They have compiled the data from the Seattle study an created an interactive map of the waste. To view the map you have to do a little study for them. (source) I look forward to seeing more information coming out of this study. Some of the items are scary; A coffee cup that somehow went from Seattle to Chicago, A plastic video tape cover that is in the ocean, six items that ended up in a Oregon State Forest and finally a piece of Styrofoam that was last tracked just off the Tsawwassen Ferry Terminal. Some of the longest traveling items out of Seattle where e-waste and hazardous material. Printer cartridges going to Mexicali, cell phones to Fort Worth, and Batteries to Atlanta and Pennsylvania. I think with a larger study we will see some of this material leave the country for overseas. So do you know where your garbage goes? To find out try doing some searches like ‘where does my garbage go <city name>’ or county name, regional district, metropolitan area. You can also find out what is recyclable in you are and talk about what it becomes. Do you have composting? In some place you can put anything that will compost into a separate can to be collected and composted in a industrial facility. Can you find out what percentage of waste is being divert from the landfill? Please feel free to post anything you find about your local garbage to the comments below. I see a lot more trash on the beach these days, especially plastic.